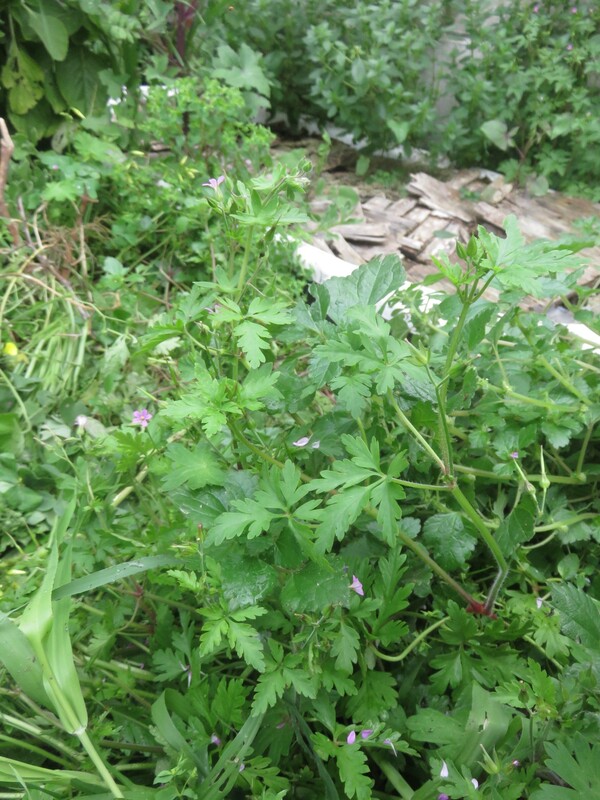 I discovered Geranium robertianum's little brother while weeding. It tugged at my olfactory senses and set me wondering, but, I've been so busy, until lately I didn't follow up on its promptings. Recently I have embarked on a very interesting new research direction. First of all a talk by a local expert on indigenous wild vegetables captivated me. This interest developed into a more wide ranging interest in all the naturalized, wild and pavement plants in our city. When you find out you've been trampling on an apothecary of ancient traditional medicines, or grinding delicious salad additions into the ground with your boots you begin to tread more carefully and be more present and observant, and it permanently changes the simple act of walking through the urban land-scape. It does bring something wonderful into the ugliest drabbest places. In the last few months I've become more and more interested in plant chemistry, nutrition and herbalism. My interest was spurred on by the discovery of all the South American plants we take fore granted, and some we never have seen here. It was awakened by watching the wonderful series 'Remedy' as well as struggling with some stress related illnesses which have entered my life in the last two years. 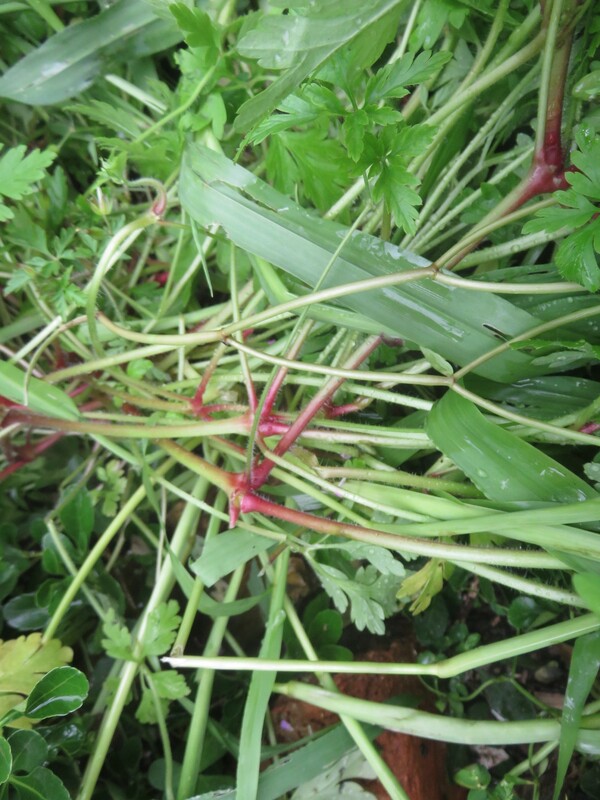 When working in my garden chopping and dropping the rank weeds which have come up in the rainy season, I am often surrounded by a strange smell, reminiscent of coriander greens but heavier and funkier. My new interest drove me to identify this plant, which has been growing in my garden anonymously for the twenty years I've been here. What a discovery I've made. I'm nearly convinced that the so called 'weed' is Geranium purpureum. 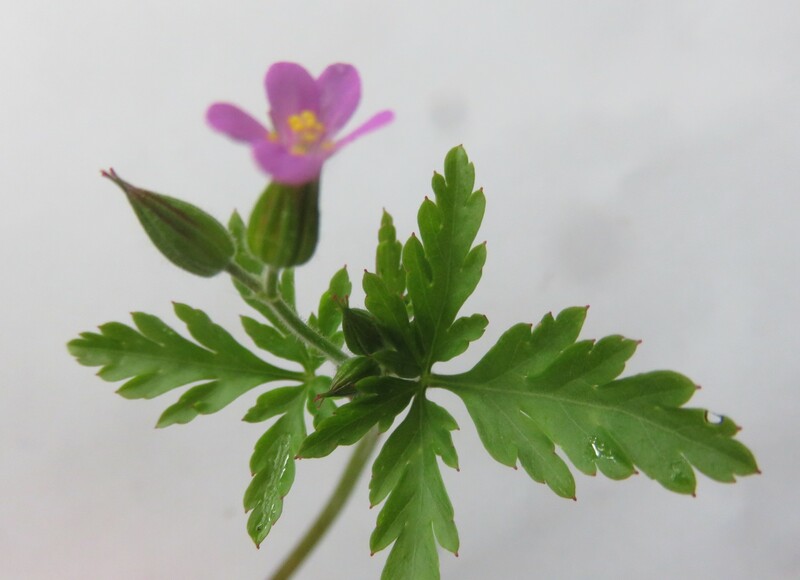 Its a close cousin or little brother of Geranium robertianum which has according to sources, so many similarities that they are hard to tell apart and may be used in similar ways. They have identical nutritional and medicinal properties according to one source, but they provided no support for this. Geranium robertianum has been known as a medicinal in Europe for centuries. Its a powerful super herb. Geranium robertianum is known as herb Robert, or crane's bill in the U.K., and sometimes by the unflattering common name of stinky bob. The plant name is an eponym for Robert the French abbot of Malerne who had a legendary reputation as a herbalist. Stinky bob originates in Europe from the British Isles across to the Caucasus. It has become naturalized in many parts of the world and is on the list of noxious weeds in the state of California. I use simple layman's terms to describe it. It has a small five petaled pink flower with white stripe which is radially symmetrical when open and orange pollen. The smell of the rubbed leaf is described as burning tyre or a funky smell by some, and by others as herby, like coriander. The stems are upright and hairy turning red in a lot of light. It is annual or biennial. Seed is ejected by as much as 20 feet or 6 meters when the capsule dries. What I think I have in my garden is G. purpureum also known as little robin, or lesser herb Robert. 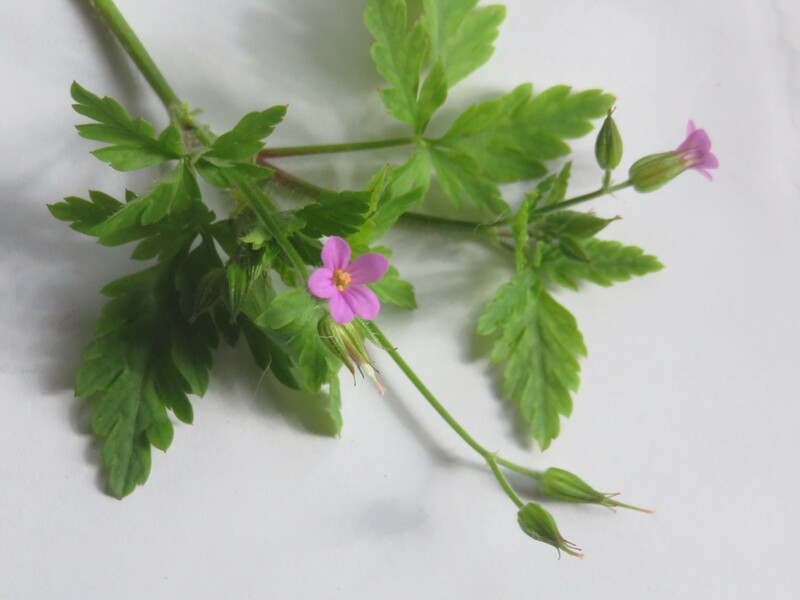 It has a very similar leaf to herb Robert, in accordance with the description, smaller flowers, yellow pollen and less hairy stems which are also less red. The plant in our garden is only red at the branching nodes. It is also easy to pull up, as in the description, but hard to eradicate, which I was trying to do until I became enlightened. It returns every rainy season. 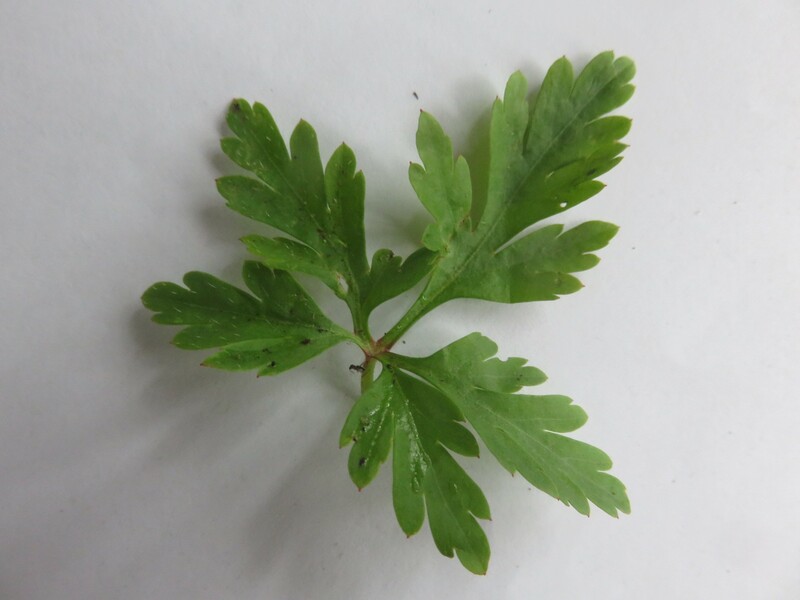 It has the same crane bill seeds, the strong smell, vaguely burning tyre but also coriander as I've seen described. Apparently some people love the smell, while it makes other people nauseous. I personally find the perfume very pleasant when brushing against it in the garden. 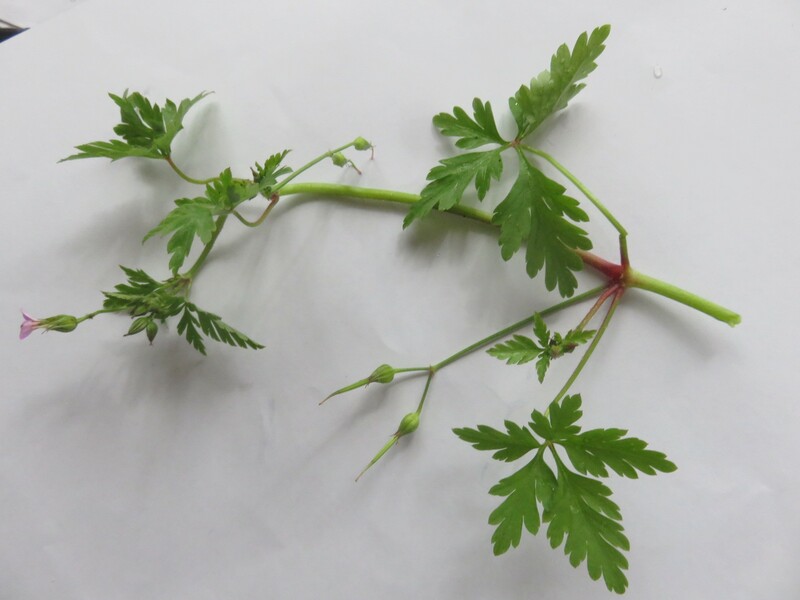 This little version of herb Robert is native to north Africa, Europe and Asia, slightly more Mediterranean in distribution it seems, so it would make sense that it thrives in Cape Town gardens. However our little flowers are not really radially symmetrical and those of G. purpureum and all other wild and garden geraniums have radially symmetrical flowers. On seeking another sample in the garden I found that they do have radially symmetrical flowers. Perhaps the bush at the back of the garden is a variant. I am not a hundred percent certain of the identity of my weed and I would recommend caution, research and certain identification before consuming anything looking similar. There are toxic weeds in north America with the same deeply divided leaf according to one video I watched. I am not a qualified herbalist, nor a botanist expert at identification, just a curious explorer, and I read and taste, but have no lived experience of the efficacy of herbs and I would hate it for someone to just believe what I say or misinterpret what I say, or follow carelessly and do themselves harm, and this is a warning, that I will take no responsibility for the consequences of my resumes here, of my reading. I cannot guarantee my sources as reliable, as it is. This is just an exploration of what people are saying. Please do your own research before consuming anything. Geranium purpureum (if this it is) is really easy to pull up out of the ground, if you want to remove it. 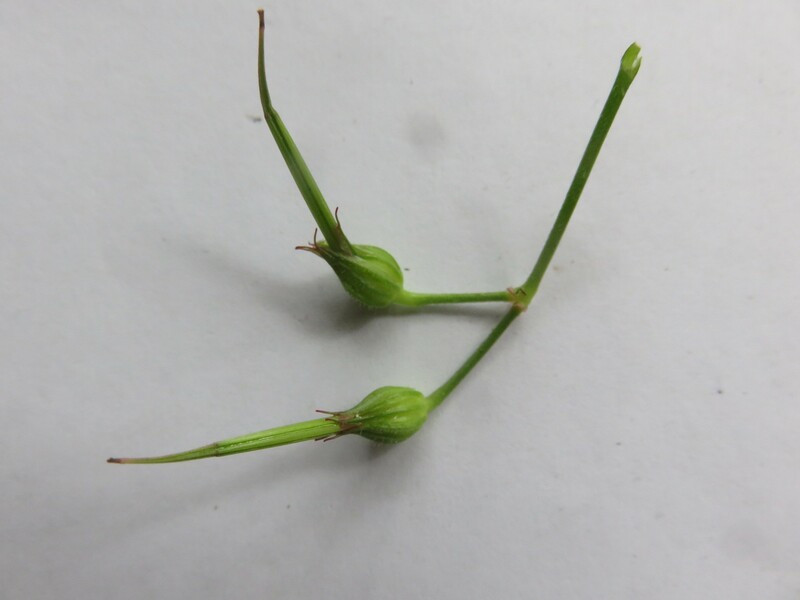 If you want to plant it you can collect the seed capsules after flowering when they are 2 cm long. Dry them for four days and sow the seed in a shady place. 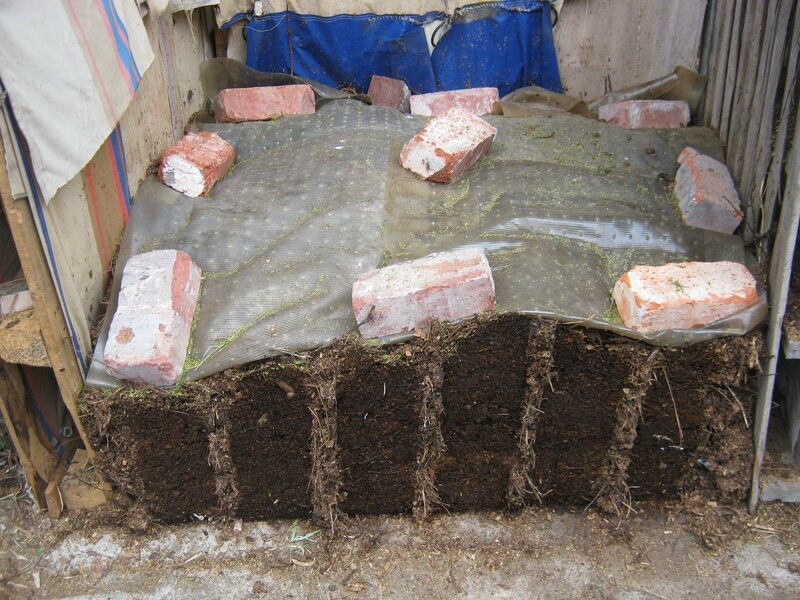 Cover lightly with soil and water regularly. 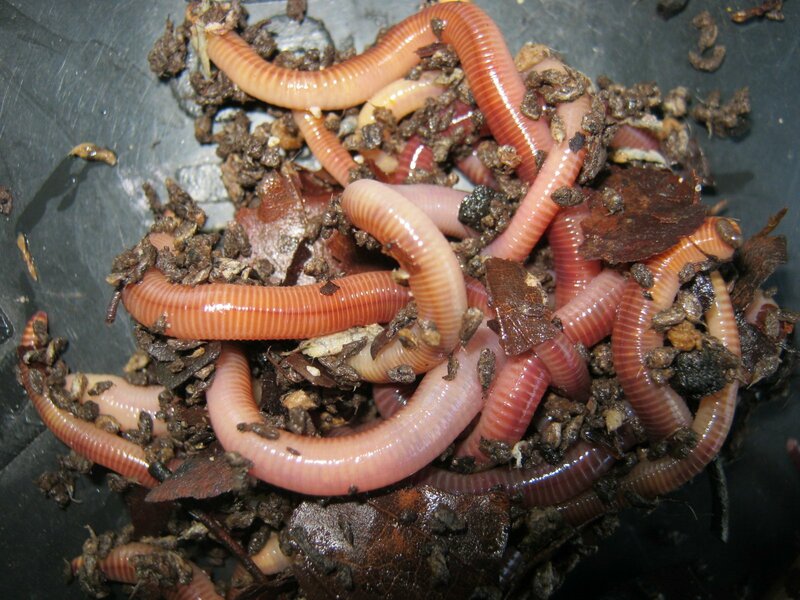 Once established they will reseed themselves in your garden, and possibly become an invasive menace in your state ! Geranium robertianum can be used as an insect deterrent. Just rub the leaves on your skin. This works for both herb Robert and lesser herb Robert, or G. purpureum. This insect repelling property makes it a good companion plant for vegetables and flowers. Plants seem to grow well next to it, as other authors have observed and I can confirm in my own garden. Geranium robertianum contains carotenoids, Vitamins B and C, calcium, potassium, magnesium, iron and phosphorus. The active phytochemical is the plant mineral germanium which improves oxygen transport to cells, and stimulates electrical impulses, according to the Australian herbalist Isabell Shipard. She advocates it in the fight against cancer, especially as a preventative, and helping with recovery. She claims lack of oxygen in cells is what brings on cancer, citing Dr Otto Warburg, the Nobel Lauriate, who stated in 1966 that low oxygen was typical of cancer cells. He observed this when his research revealed mitochondrial dysfunction in cancer. 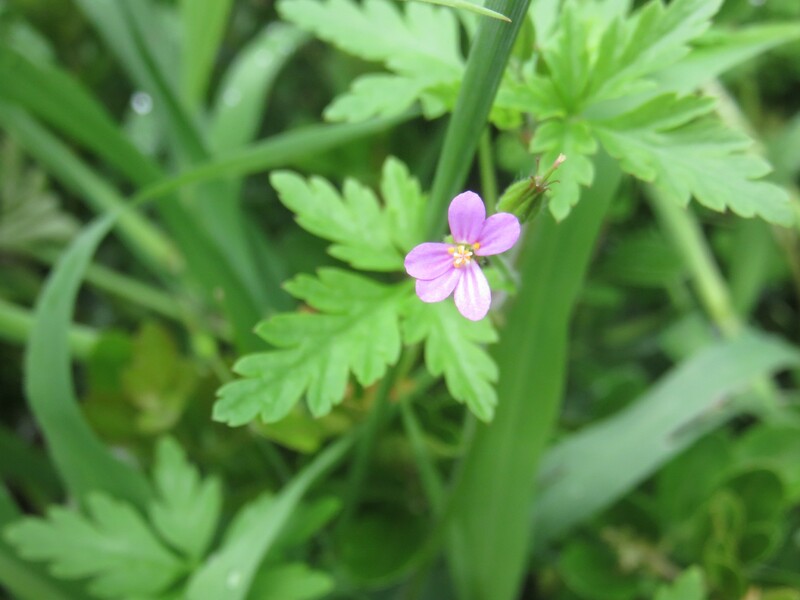 Ms Shipard uses the chopped leaves of herb Robert sprinkled on her meusli, or takes it as a tea. She believes cancer is also caused by exposure to toxic chemicals in our food, electromagnetic radiation from appliances in our environment, stress and eating non organic, nutrition poor food. She recommends using five to seven leaves with stems, or a teaspoon of dried herb. You can take the chopped leaves with raw egg yolk in the morning. It is said to minimize radiation damage from mobile phones, computers, microwaves and x-ray examinations. Germanium the plant chemical is also thought to help with colitis, chronic fatigue, cataracts, diabetes, mouth ulcers, bleeding gums and pain relief from rheumatism and arthritis. It gives energy, boosts immunity, is a free radical scavenger, with antibiotic, antiviral and antioxidant properties according to the fabulous blogger and author of Julia's edible weeds. It may react with blood thinning medication as it affects blood viscosity. As a foot bath it is a great pain reliever. The herbalists in the series 'Remedy' recommend that with a serious illness like cancer, requiring very strong therapy, mainstream medicine has a place, and it is in the integrated approach, or the use of both herbs and mainstream therapies that the best results are seen, better than both therapies alone. Herbal tonics help with managing the symptoms of chemotherapy and making a faster recovery. Some famous people they mention chose to only use herbs and are no longer with us. In the Cape we have only one indigenous geranium, Geranium incanum, but 6 introduced ones. There are some that are very similar in appearance to Geranium purpureum and Geranium robertianum that may be found here or in north America. One is G. carolinianum. They claim it is edible, nice in salads, smoothies and in cooked greens. It grows in disturbed areas and is native to north America. 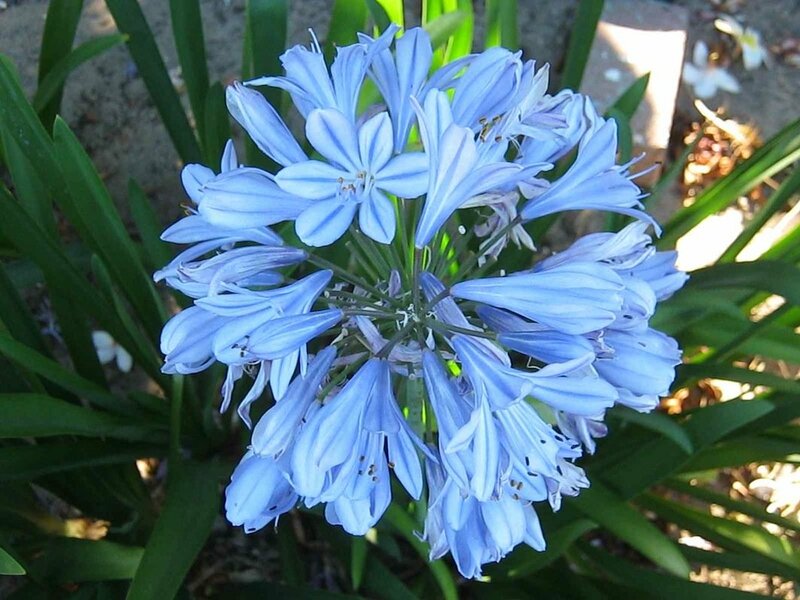 G. lucidum is originally from Europe, West Asia, and north Africa, G. dissectum is native to Europe. G.maculatum or cranes bill, is found in woodland in north America. The rhizome is used medicinally as a tannic astringent for drying up wounds, and gastro intestinal conditions unspecified. It can be made milder by infusing in milk. G. molle is a common weed at the Cape with many medicinal properties. To try and find out if I have the right plant I googled common weeds in Cape Town and I came across a picture just like our friend. Labelled as weeds were also plenty of our gorgeous native lawn flowers featured in my article on tapestry lawns, half of the other weeds I know are edible or medicinal, even with my limited knowledge. Under such a keyword there were a lot of advertisements for Roundup or glyphosphate which is still legal here. Oh my country, when will we learn, when will we all be safe and healthy and able to appreciate what is given. 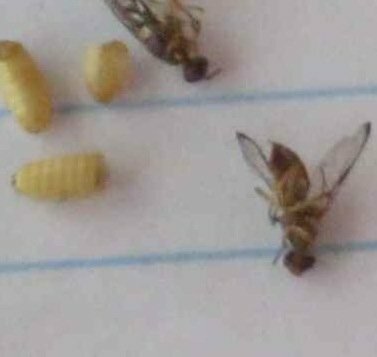 The rich white folk in some parts of town have exterminated the insects and then the birds using Roundup, and still they want dull monocultural lawns. Closely related to geraniums is the genus Erodium, or heron's beak, of which four are introduced, such as E. muscatum, and the genus Pelargonium, of which South Africa has many native varieties which have been spread around the world.